Since 2011, HBS Dealer has reached out to suppliers, distributors, manufacturers, vendors, retailers and home owners in search of high-performing, service-oriented, community-minded hardware stores, lumberyards, or farm and ranch dealers worthy of All-Star status. It’s a tribute to this industry that each year brings a surplus of high-quality nominations. HSB has selected Lockridge, Inc. for this years Iowa award winner. 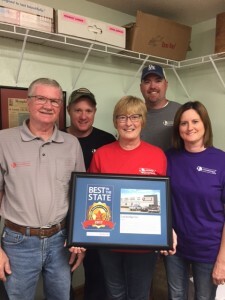 Lockridge has three stores in Iowa including Promise City, Centerville, Chariton and one located in Unionville, MO. Five members of the Housh family keep four locations humming: Dale Housh, his wife Jill, his sons, Clint and Caleb – who also serves as mayor of Seymour – and daughter, Courtney. Together they help run a business that has grown from a small hardware store and lumberyard into a local leader in supplying materials for new home construction, remodeling and farm and fencing. No detail is too small, including installation of solar panels on one of the store’s roofs.